During the Soviet period, timber production continued in the north of European Russia at an escalating rate and since the 1930s Siberia and the Far East have been the important timber-producing regions. At present, the Arkhangelsk oblast is the leading producer, followed by the Krasnoyarsk region and Karelia. The accessible regions of the Far East are pre-eminent timber-exporters with over 70 per cent of timber being sold nationally or abroad. In the European territory, both coniferous and small-leaved deciduous species are harvested, while Siberia and the Far East supply softwood. Mature tree stands, fit for commercial exploitation, constitute about 60 per cent of forests. However, their distribution across the region is not uniform (Table 23.2). Mature forests are concentrated mainly in Siberia and the Far East (i.e., away from centres of consumption). Forests of European Russia and the Urals, which have been impacted heavily in comparison with more remote areas of Siberia (although far less than the forests of Western and Central Europe), tend to be younger (Nilsson et al., 1992, 1996). Apart from the Arkhangelsk oblast and Karelia, large areas of commercially usable mature forests exist in the Komi Republic in the northeast of European Russia and in the Sverdlovsk oblast in the Urals. The annual allowable timber harvest in Russia is estimated as about 1.5 billion m3. Across the country, not more than 25 per cent of it is used. However, there is an important distinction between the exploitation of forests in the European territory and the Urals, and in the Asiatic part which is related to accessibility. Much of the forest resources of Siberia and the Far East are practically inaccessible and in the areas of commercial logging, undercutting is often typical because of the lack of transport infrastructure. In contrast, European Russia contains only a quarter of the national timber resources (Table 23.2) and accounts for 60 per cent of all transported timber. The timber-producing areas of European Russia (e.g., Tatarstan and Chuvashia in the Volga region), are located close to consumers and have a relatively well-developed transportation network. In these regions, overcutting of forests occurs widely and exceeding CAC has been a common practice since the 1930s. 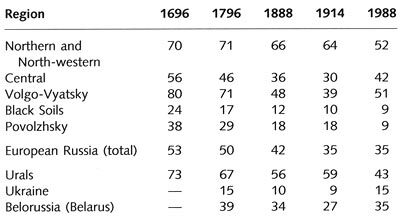 As a result, many areas that were rich in timber at the beginning of the 20th century, are now timber deficient (Table 23.3). In the densely populated regions, there are very few mature forests which can be exploited commercially. Even in the comparatively remote Arkhangelsk oblast, the commercial exploitation of mature forests can continue at the present rate for only a few more years (Serebryanny and Zamotaev, 1997a). Together with other sectors of the Soviet economy, timber production peaked in the 1970s and the 1980s when it reached approximately 300-330 million m3a-1 Soviet and Western sources provide very different estimates of areas on which timber was cut. Barr and Braden (1988) and Braden (1988) estimate that annually timber was cut on 3.5-4 million ha. According to official Soviet and Russian sources (Sostoyanie, 1995; Les Rossii, 1995), clear-felling covered about 2 million ha in 1989. A very important aspect, however, is that according to another official Soviet source (Ekologicheskaya obstanovka, 1990), reforestation occurred on only 0.6 million ha (i.e., less than a third of the deforested territory). Another 1.3 million ha are the areas of natural regeneration. The difference between deforested areas and the territory on which forests are restored therefore exceeds 1 million ha, according to the official Russian estimates and 3 million ha, according to the Western estimates. The growing trend in timber production changed in the 1990s when the economies of Northern Eurasia entered the difficult period of economic restructuring. Between 1988 and 1993, timber production declined to approximately 200 million m3a-1 and the area of commercial cutting was reduced to 1.25 million ha (i.e., harvest by both stock and area was halved (Les Rossii, 1995; Korovin, 1995). In the Arkhangelsk oblast, timber production was reduced by a factor of 5 and has reached its pre-Second World War level; in the Tyumen oblast, a 15 per cent annual decline was registered (Obzor, 1996). This change is apparent in all timber-producing areas. However, remote areas are among the most badly affected. One of the main reasons for it is the withdrawal of state funding for road construction which, due to the widespread occurrence of swamps, requires extremely high investment. Without a developed network of roads, transportation is only possible in winter which imposes a seasonal cycle on the timber trade and requires working under extremely severe conditions. There are two significant implications of this change. First, there is a stronger pressure on the accessible regions which by now have already been overdeveloped. Second, in areas, lacking a communication network, fellings occur not in the designated areas but wherever forests can be logged cheaply. Reforestation also declined by 30 per cent between 1988 and 1993, while production of seedlings and planting dropped by nearly 50 per cent (Korovin, 1995). Although harvesting rates have declined greatly, allowing for timely regeneration of forests, in the long term, insufficient effort at restoration of forests may prompt serious problems in the European territory and the Urals.